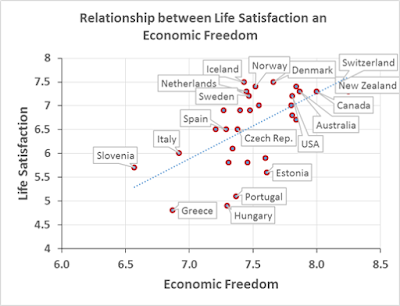 Freedom and Flourishing: How close is the relationship between freedom and life satisfaction? 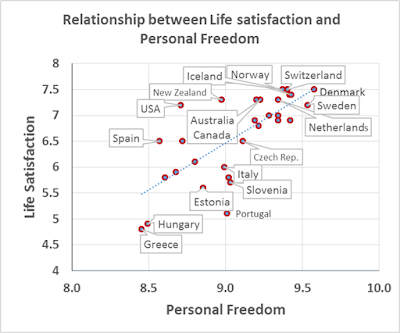 How close is the relationship between freedom and life satisfaction? “The limitation … of the power of government over individuals, loses none of its importance when the holders of power are regularly accountable to the community, that is, to the strongest party therein” (On Liberty, Chapter I). It is possible, however, that freedom makes little difference to country rankings. That might happen if freedom indexes are highly correlated with life satisfaction. I am focusing attention here on the relationship between freedom and life satisfaction because most of the 11 components of the OECD’s Better Life Index are correlated with life satisfaction. Civic engagement is one of the exceptions. The others are education, safety and work-life balance. 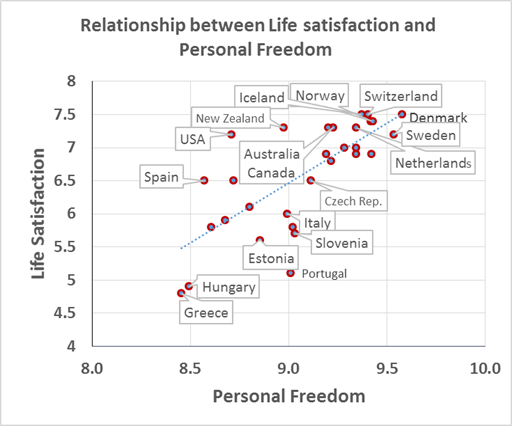 The relationships between life satisfaction and the two freedom indexes are shown in the charts below. There seems to have been a fairly strong tendency for people who argue that government policies should be directed toward raising average life satisfaction to advocate policies involving restrictions on freedom. Such people have been barking up the wrong tree. The countries with highest average life satisfaction are those with the least restrictions on economic and personal freedom. I neglected to refer to a recent article by Boris Nikolaev entitled "Economic Freedom and the Quality of Life". This article provides a fairly extensive discussion of the relationship between economic freedom and the quality of life at a national level. Labels: Big government, Economic freedom, emanicipative values, Well-being measurement issues, What is happiness?, Why freedom?